What are reviewers saying about Space Pioneers? Quest: The History of Spaceflight Quarterly (Volume 22, No. 2, September 2015). Quest is the only peer-reviewed publication solely dedicated to the history of spaceflight. 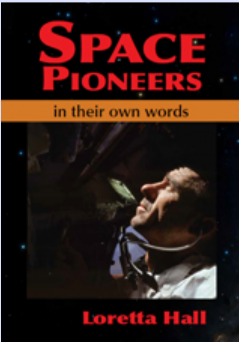 "Space Pioneers: In Their Own Words is relatively unique in its primary focus on minor players in space exploration history, which provides insight into the day-to-day challenges of research and development that tend to get lost in the bigger picture.... Although the author edited and corrected the accounts with a 'gentle but firm hand,' they still retain the spirit and memories of those interviewed; their voices are clearly heard. German scientist Cynthia Sommers-Guzevich summed it up nicely: 'White Sands is old history. People don't know what we did out there.' Thanks to Loretta Hall, now they do." Lisa Westwood in Quest: The History of Spaceflight Quarterly. Unless otherwise attributed, all SpacePioneerWords.com content is © Loretta Hall, 2013-2019.